Why the teaching profession has a distinctive role in society? Education is essential both for an individual betterment and for the society as a whole. The teacher’s role in society is of crucial importance and value. 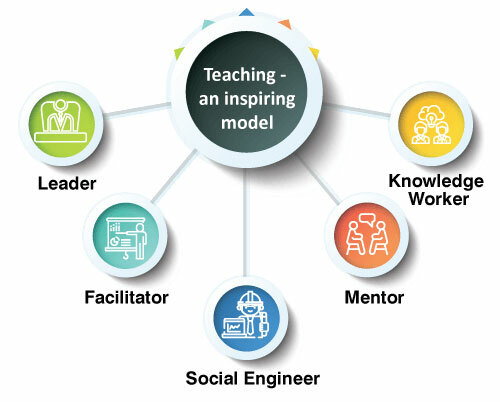 Teaching has a profound influence on society and no other profession can make a match of teachers in building society. Teachers play a constructive role in molding the lives of children during the formative part of their schooling thereby transforming the latter into active and responsible citizens of the nation. Some of the great teachers presided over political and industrial revolutions across the world. Teachers are a reliable source of advice for students in making important life decisions. They have the ability to shape the future of students. Educators enable their pupils to pursue higher education, explore career options and compete in events. Some students who are susceptible to showing misbehavior, absenteeism or disengagement are more dependent on engaging teachers. An influential teacher makes learning fun, for stimulating and engaging lessons are crucial to a student’s academic success. Teachers are the ones who enlighten the youth of society who in turn become the leaders of the future generation of people. What children taught by their teachers at a young age will stay fixed in their minds for the rest of their lives. Teachers are central to promoting literacy and numeracy. A popular teacher becomes an influential person for his/her students. Students tend to a leaf out of a teachers’ mannerism, costumes, style of conversation. Conclusion: Teachers will have to advance and learn from nations that have previously enhanced their education systems. To instill the skills required to make children global citizens, the teaching community needs to understand the challenges the planet is experiencing and rise to the stature of teaching complex skills that are demanded by employers and globalization.